The 'Dr. No' crew arrived in Jamaica on Sunday 14th January and began filming on Tuesday 16th January 1962 at Kingston, Oncaros, Montego Bay and the Palisadoes Airport. 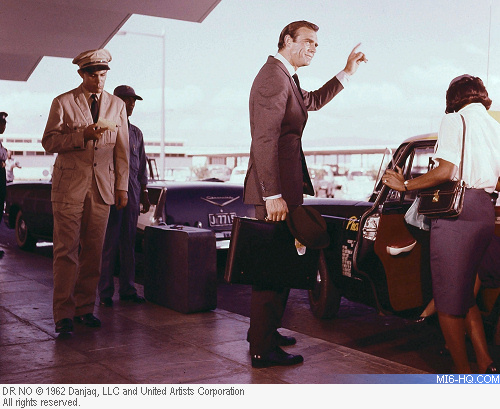 Sean Connery's first day as James Bond was spent at the airport, and the afternoon was spent shooting the phone-booth scene in which Bond discovers his chauffeur is a double-agent. Young filmed several takes and caught one close-up where Connery was glaring intensely at actor Reggie Carter (pictured below). Young loved the shot and later recalled that it was “the beginning of Bond”. After the first day’s work, the crew had secured footage that would last just under two minutes in the final cut. Much use was also made of local talent to play smaller roles. Dolores Keator played Strangways’ secretary Mary Prescott because she owned the house that the crew were shooting in. The bartender seen at Puss-Feller’s club was a relative of costume designer Tessa Welborn. Other local amateur actors took the roles of the Chief of Police and the construction worker, who watches the car carrying the thugs pursuing Bond as it careens over the edge of the cliff. 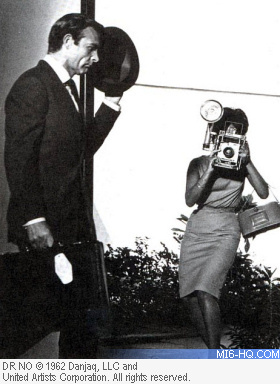 Marguerite LeWars (pictured above with the camera) was serving as the crowned Miss Jamaica when 007 came calling. She landed the role of Dr. No’s photographer after production crew encountered her at Kingston airport as they were preparing for filming, where LeWars was an employee at the time.